I love how egg custard smothers a pudding in warm, creamy lusciousness. 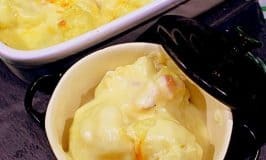 Traditional English egg custard sauce is the perfect accompaniment for so many of my favorite desserts, I thought it was high time I share my recipe. Bread pudding, plum pudding, apple crumble, Eve’s Pudding, Queen of Puddings all taste best with custard, and Irish sherry trifle just would not be the same without a custard layer. 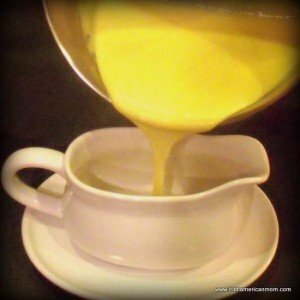 Bird’s custard powder is a quick and easy solution for any custard lover, but nothing compares to the flavor of real, homemade custard. The ingredients are pretty simple. Lump free, smooth custard is totally dependent upon technique. First pour the whipping cream into a saucepan. Next add the milk. Heat the cream and milk over very gentle heat, bringing it just to simmering point, when a few tiny bubbles start to appear at the edge of the saucepan. Do not boil the cream, so watch it carefully, and use low heat. 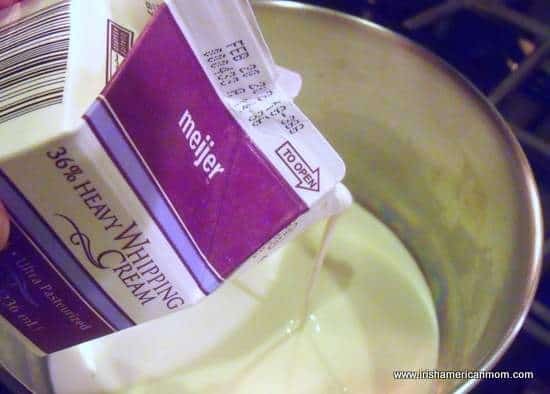 If you don’t want to use heavy whipping cream, you can use all whole milk instead, but the consistency of the custard will be slightly thinner. Reduced fat milks don’t work very well, because let’s face it, you just need some of that old fat to make custard thicken. Even though I just told you to pay close attention to the cream as it heats, I am now going to distract you by preparing the eggs. 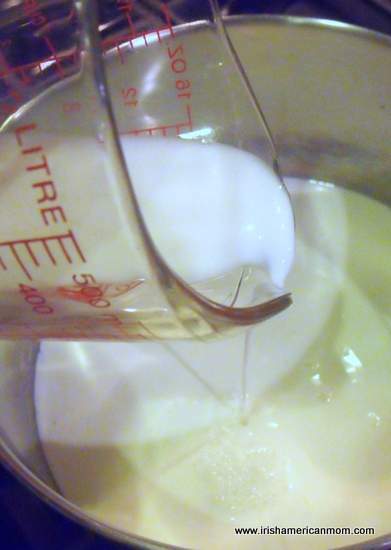 If the cream is on low heat there should be plenty time for the next few steps, before it reaches simmering point. I like to let my eggs come to room temperature before I make custard, so I take them out of the fridge an hour before I start cooking. If they are too cold, there is an increased chance they might curdle when the get hit by hot cream very shortly. 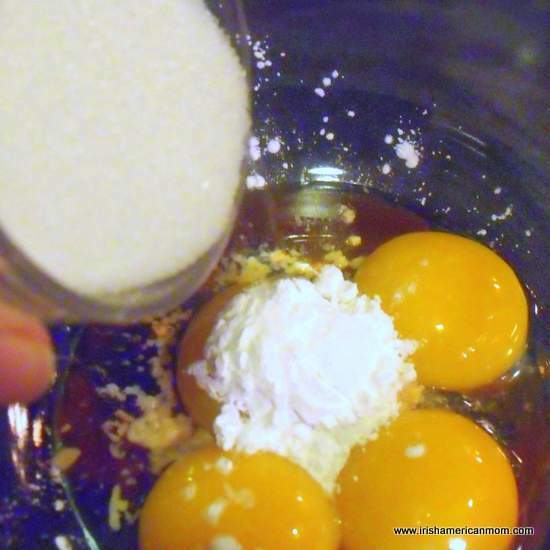 First, break the eggs and separate the yolks from the egg whites. 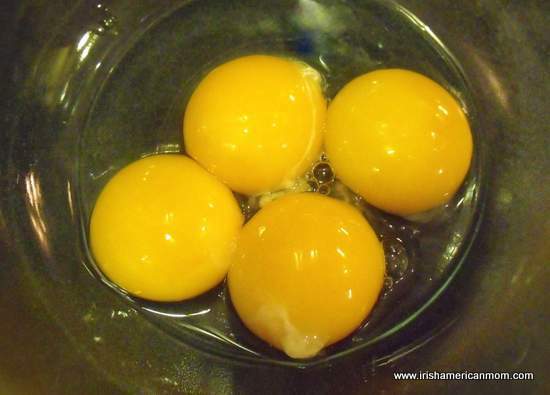 Put the four yolks in a bowl. 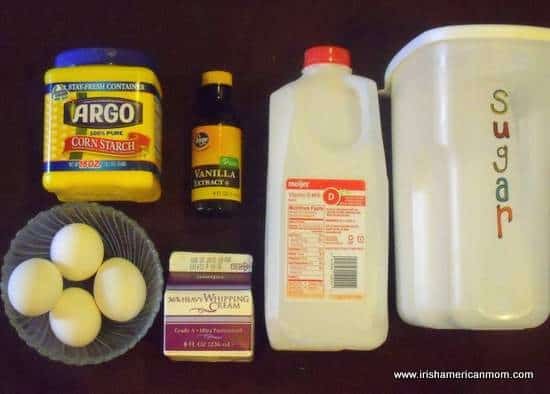 The egg whites can be used for another recipe, an egg-white omelette, or a pavlova is my favorite. I’ll share that recipe on another day. Next comes the vanilla. I like to use pure vanilla extract not vanilla essence. The flavor of the real thing is much nicer. Toss in the corn starch. If you use all whole milk instead of cream, you may need to increase the cornstarch to 2 teaspoons to achieve the desired consistency in your custard sauce. 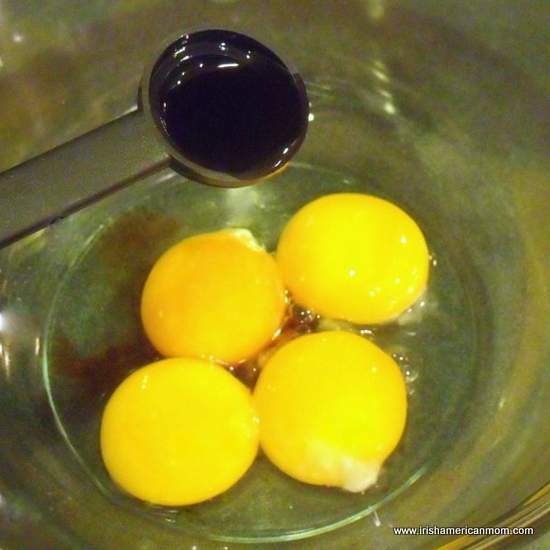 Whisk the egg yolk mixture together, making sure there are no corn starch clumps. 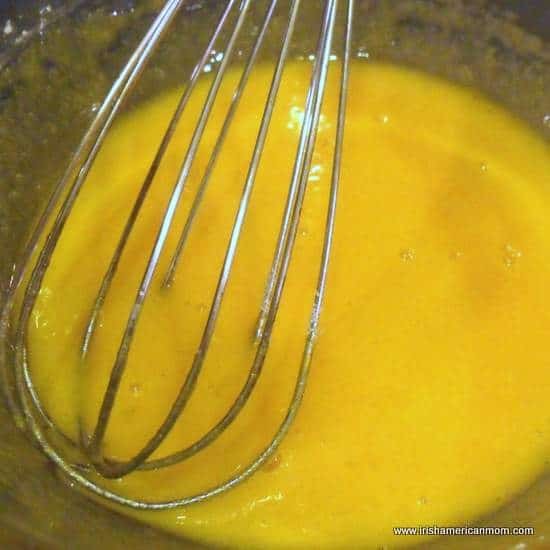 Take the saucepan of simmering cream and pour it into the egg yolks, whisking all the time. Whisk! Whisk! Whisk! The only way to achieve smooth, creamy custard is to whisk vigorously. I mean put some muscle into it. Next return the custard to the saucepan. Return to a gentle heat, and once again, build those arms and whisk it. Whisk the custard continually as it slowly returns to a simmering point. The sauce will thicken just before it reaches boiling point, and once again don’t let it boil. The flavor becomes too intense if custard bubbles and boils. It gets lumpy too if it overheats. 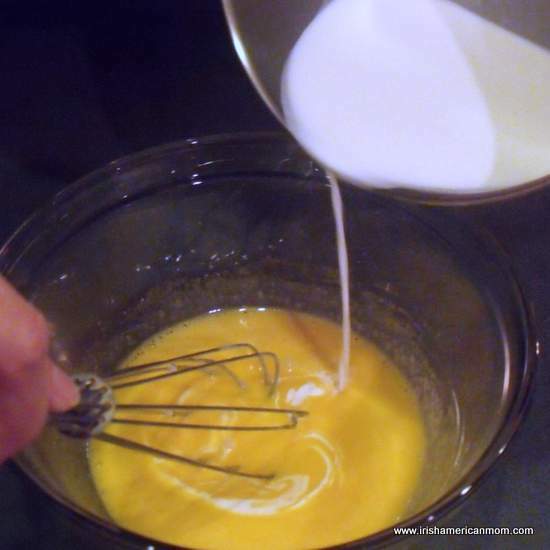 So the key to custard is – WHISKING LIKE CRAZY. Once the custard has returned to simmering point, transfer it into a serving dish or just pour it straight over a favorite dessert. 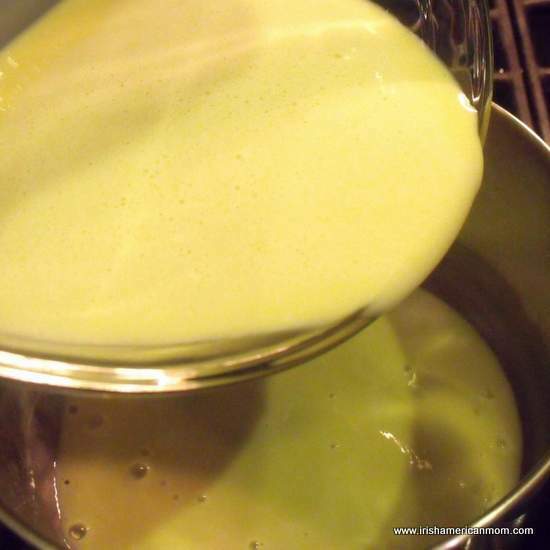 Custard can be stored covered in a refrigerator, then reheated using a double broiler over a saucepan of water. Once again, reheat over gentle heat, to avoid burning the sauce. Creamy vanilla egg custard is the perfect topping for pies and warm puddings - an English and Irish favorite for sweet treats. Step 1 In a large saucepan heat the cream to just below simmering point. Do not let the cream boil. 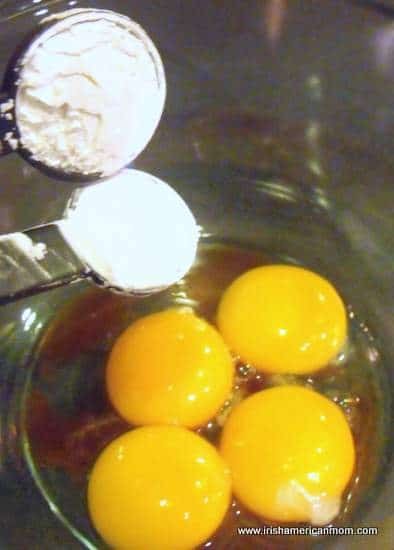 Step 2 While the cream is heating whisk the eggs, vanilla, corn starch and sugar together in a medium bowl. Step 3 Continue whisking the egg mixture with one hand, while gradually pouring the hot cream into the bowl. Whisk continually to prevent lumps. Step 4 Return the custard to the saucepan used to heat the cream. 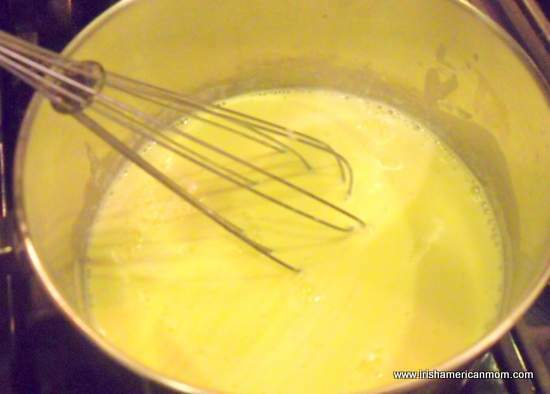 Over very gentle heat continue to whisk the custard as it thickens, keeping it smooth with vigorous whisking. Allow to heat just to simmering point. Step 5 Serve hot, poured over your favorite pudding. Step 6 Custard can be prepared in advance and stored covered in the refrigerator. Reheat in a double broiler over simmering water, whisking as it heats. Wishing you all happy custard making and perfect desserts. I printed this recipe too. I need to start cooking. My kids will love this over the pudding. I hope you enjoy these recipes Joyce. 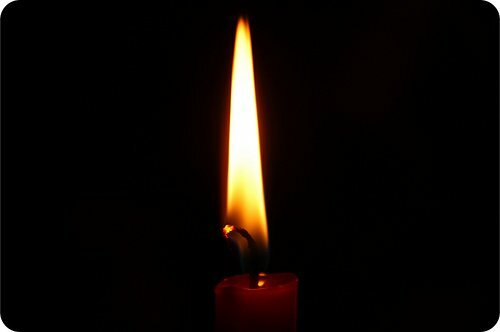 Thanks for stopping by and leaving a comment. Do you have a cookbook available? I’d surely safe money on ink and paper:-)! Our St. Patrick’s Day dinner should be great this year! Thank you for thinking my recipes might be cookbook worthy. It would be lovely to get them published some day. Have a lovely St. Patrick’s Day and thanks for checking out my website and recipes. 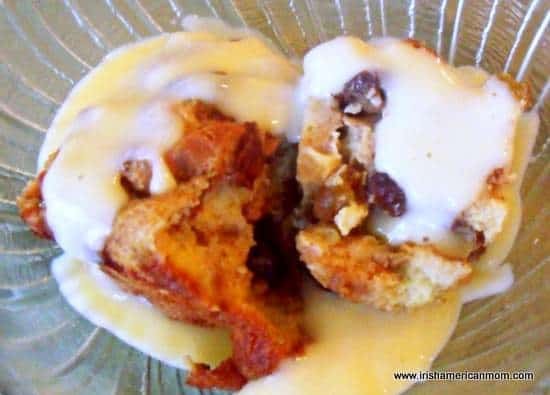 Hi, just thought I’d let you know my kids and I are making your cinn raisin bread pudding and egg custard this afternoon for tonight’s st pattys day feast 🙂 Your recipes look amazing! My husband is very Irish and will be so excited for bread pudding 🙂 Thanks so much! Dear Lindsay – I hope this bread pudding and egg custard was a hit in your house. It’s a favorite in mine. Thanks so much for checking out my recipes and for stopping by my blog. I hope you all had a wonderful St. Patrick’s Day celebration. Just had to tell you that we’re featuring this amazing recipe in our “The Monthly Musing” newsletter at Life in a House of Testosterone for St. Patrick’s Day! I cannot wait to try this one out myself! 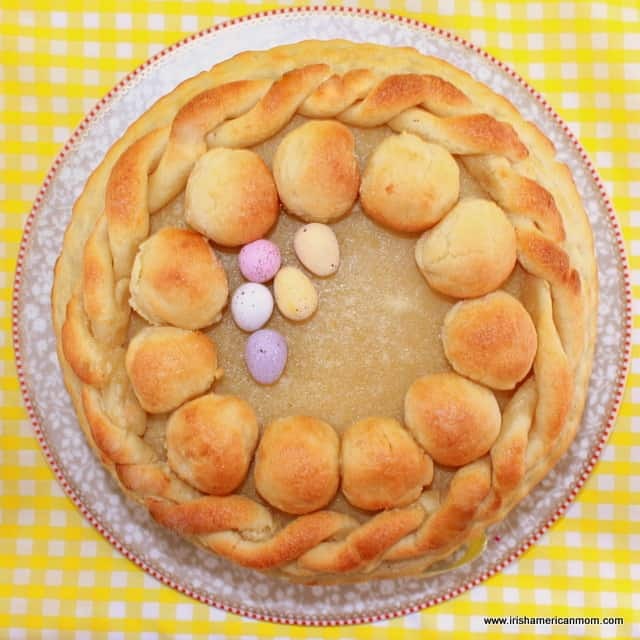 Kim – That’s wonderful, and thanks for linking back to my recipe. I really appreciate it. Just returned from Ireland. We enjoyed every thing we saw, heard, tasted, & the wonderful local people met. Wanting to try hand at preparing some authentic Irish dishes here at home. Looking forward to trying your custard. Have a great Palm Sunday. 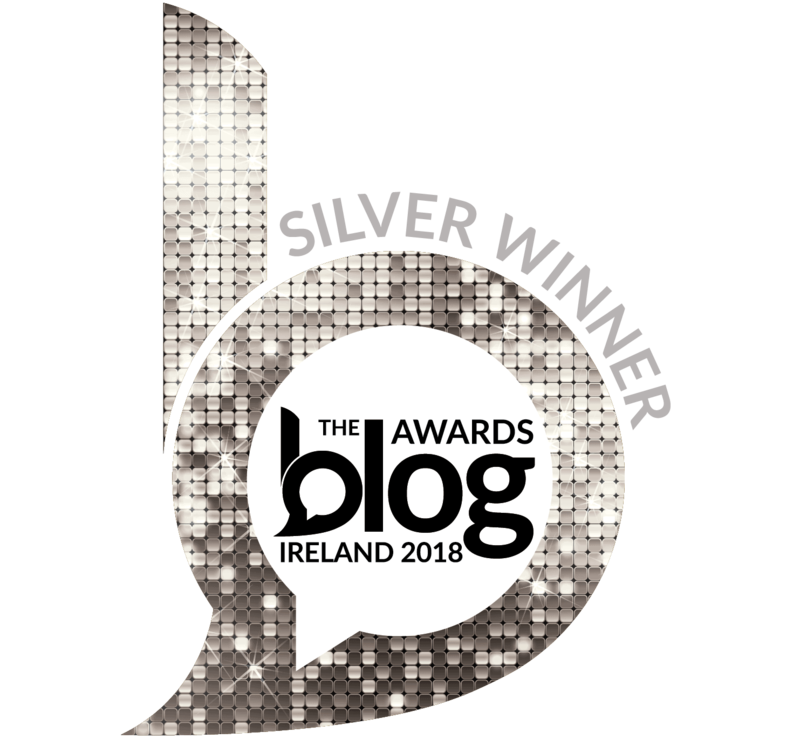 Dear Lacy – I’m delighted to hear you had such a lovely trip to Ireland. I hope you enjoy this custard. It’s a favorite in our house, especially when poured over hot, steaming puddings. This custard will probably be my new favorite custard! It’s so practical to use it in every way imaginable, thanks for this culinary trick! Hi Sylvie – I’m glad you like this custard recipe. It’s a favorite recipe in our house. I’m so glad I found this recipe!! My 20 yr old daughter wants to make Irish sherry trifle for Thanksgiving and we could not get our hands on any birds custard. We are going to try this recipe and hope it comes out right for us. 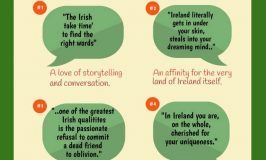 Thanks for sharing from another Irish American mom! Hi Bernadette – I hope your custard turns out great – just remember not to boil the milk. Sherry trifle is my father’s favorite dessert. It’s definitely a recipe I need to add to my blog “to do” list. Have a lovely Thanksgiving, Irish American Mom. My eight year old daughter helped me to make your bread pudding and custard for dad’s special birthday breakfast. It turned out so well that it it became dad’s midnight snack! Thanks for a great pair of recipes. Hi Kari – I’m delighted your husband enjoyed my bread pudding and custard combination. What an amazing breakfast treat. 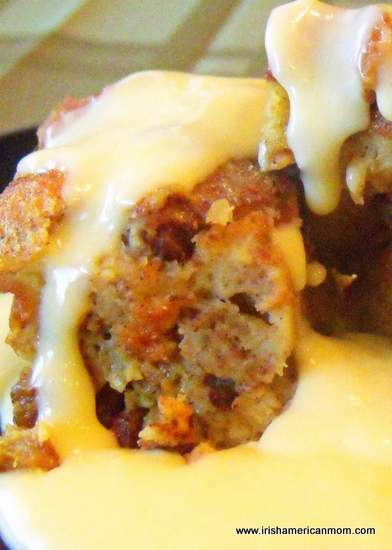 Whenever we have leftovers bread pudding is a perfect midnight snack or morning pick-me-up. 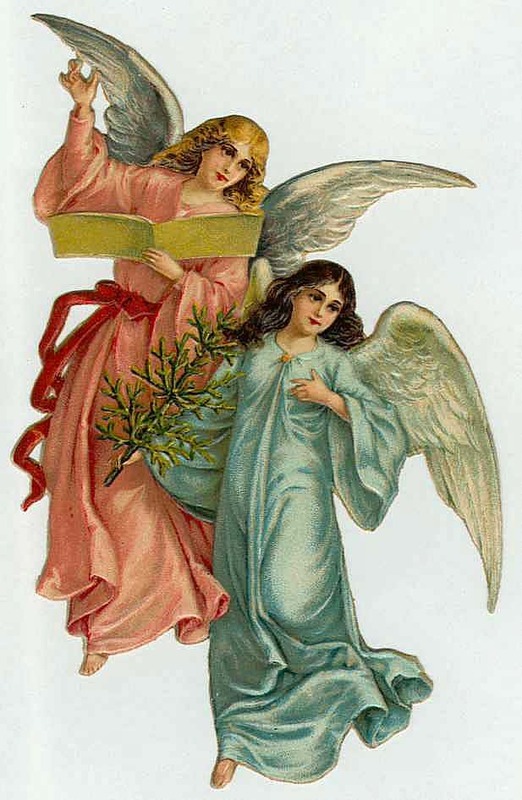 Best wishes, and thanks for checking out my recipes. Happy cooking to you and your little girl. I love your custard having a little before, had to try it and it’s great and i love custards anyways and other custards has for too much sugar and not enough liquids yours ask for milk and whipping cream and other just ask whipping cream only alone with the sugar, so love yours going to make again when i have bread pudding thank you for the recipe. Hi Viola – Thanks so much for stopping by to give my custard recipe your two thumbs up. I’m so glad you enjoyed it. Hi Elizabeth – I think you will be able to heat the milk in the microwave – the key is to make sure the milk does not boil. However, custard tends to form a skin on the upper layer when made in advance. To try to avoid this you would need to cover the top with plastic wrap, and that involves placing the plastic wrap directly onto of the upper surface of the custard so that no air gets near it. Best of luck with your church event. Thanks so much for stopping by and checking out my recipe. Thank you! I’m excited to try it! Hi Frannie – Thanks for your tip of adding almond extract. That sounds like a great way to get closer to the flavor of Bird’s custard. So glad you liked this recipe and thanks for stopping by to give it your two thumbs up. Thanks for this recipe! My mum is N. Irish, so I grew up with custard as a dessert topping, but she also often made it on Sunday evenings, served in a bowl with stewed rhubarb or prunes or apples. Hi Melissa – Rhubarb and custard was often on the menu in my childhood home too and we also had stewed prunes or apples also. Simple but delicious. Thanks so much for stopping by and checking out this recipe.